Robo-Drilldigger X is the more powerful form of Robo-Drilldigger who appears in the Battle Ring, as the first opponent faced in the Giant Luigi arena in Mario & Luigi: Dream Team. There are no major changes to his battle here. 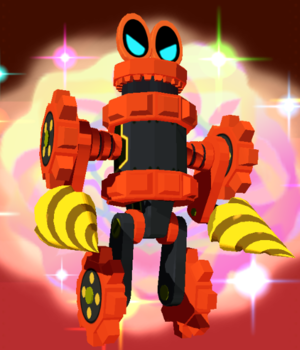 The main difference between Robo-Drilldigger and Robo-Drilldigger X is the version is red in color instead of gold. The player has to defeat it in 10 turns. To do so, the player must counter all attacks perfectly and make the maximum damage possible with Giant Luigi's Attacks. Also during this battle, Drill Stomp and Hammer Uppercut cannot be used, even if Mount Pajamaja has been defeated. This page was last edited on March 15, 2019, at 07:58.